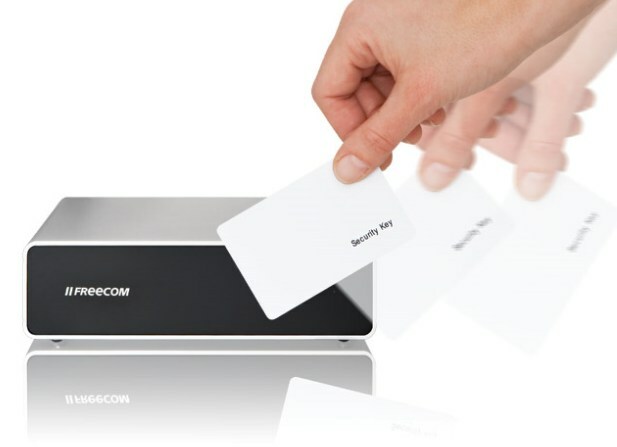 Freecom's RFID Protected External Hard Drive Seems Great, A Little Too Popular | OhGizmo! By David Ponce on 08/12/09 • Leave a comment! Freecom is selling this 2TB external hard drive for 350 euros. What’s great about it is that it can only be accessed if you happen to be carrying one of two AES-encrypted, RFID-enabled, credit-card sized keys on your person. No key, no access. The bad part now. For one, 350 euros is a lot of cash for 2TB. But worst of all, it’s out of stock, and no ETA. Bummer. Still, you can check out the product page and obsessively refresh every day until there’s stock if you’re seriously that concerned about privacy.